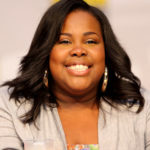 Amber Riley is an American actress, singer and author. She is best known for her portrayal of Mercedes Jones on the Fox comedy-drama series Glee (2009–2015). For her performance on the series, she won a Screen Actors Guild Award, and has been nominated for three Teen Choice Awards, three NAACP Image Awards, and three Grammy Awards. In November 2016, Riley led the West End debut of Dream girls, playing the lead role of Effie White. She won the Laurence Olivier Award for Best Actress in a Musical in 2017 for her role in Dream girls. "I have great friends around me that are positive and I think that’s the key to life is making your own path. Set your own rules because there is no set rule, there is no set look, there is no set anything. You make your own rules in your life. You make your own decisions." "When I receive letters from girls that say, ‘You give me confidence,’ I think, ‘Wow, this is amazing.’ That’s my goal: to let people know it’s truly what’s on the inside that counts." "I love Adele, I want her to be my best friend. She could come to the U.S., live with me and sing to me every morning." "As long as you are being true to yourself, you will always find happiness."